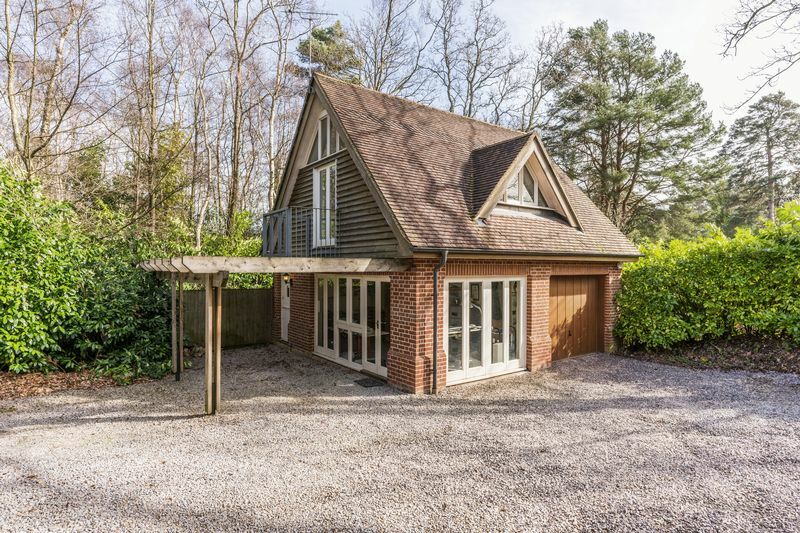 Enjoying a leafy lane location backing onto mature woodland, this impressive modern five bedroom detached property offers excellent accommodation arranged over three storeys and is ideally suited to the growing family. "We have loved living here for over 30 years; 12 years ago we had the opportunity to build our dream home in the side garden of our old house, it has been a wonderful experience and we will be leaving with very fond memories." 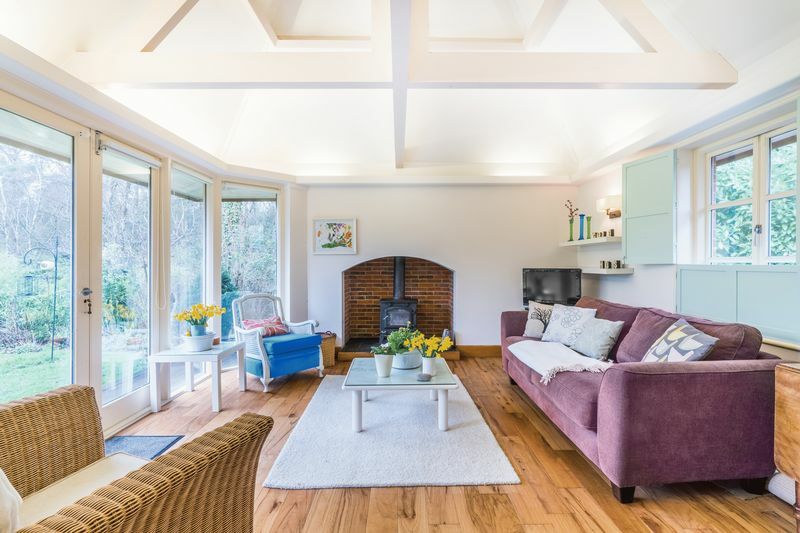 "The location is perfect, so close to Southampton, Romsey and Winchester yet in a quiet leafy lane with a wonderful outlook. We often see many species of wildlife and birds visiting our lovely garden." 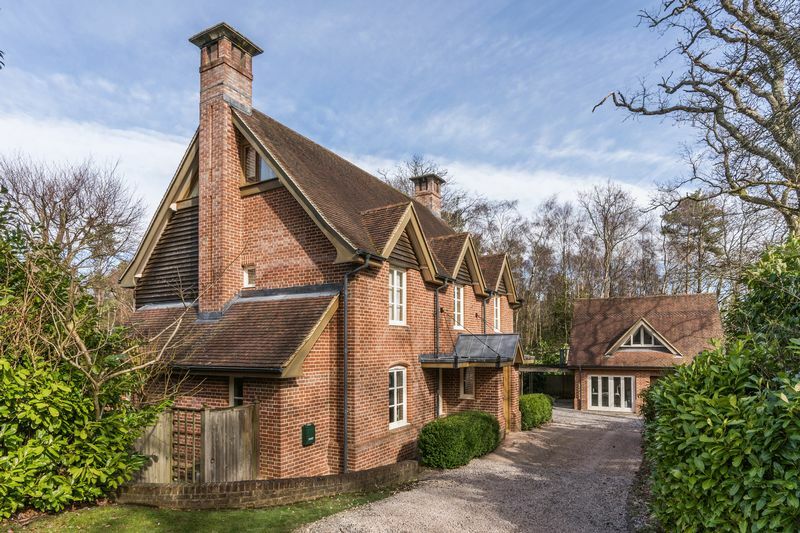 Twelve years ago the owners designed and personally oversaw the construction of this charming home to an exacting specification that offers well proportioned rooms of enviable dimensions. The detached, larger than average single garage has an adjacent home office with a cloakroom and the studio flat located above is ideal for long term guests or alternatively offering the opportunity for rental income. Woodside is classified as a bridleway boasting an impressive array of substantial high value detached houses whilst footpaths lead to open countryside that have attractive views and pleasant walks. 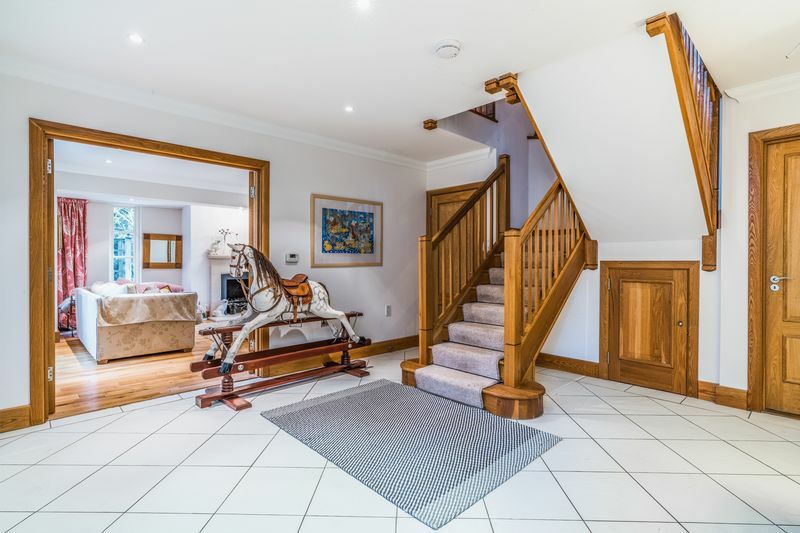 A hardwood door opens to the vestibule with a vaulted ceiling that has an open doorway leading to spacious reception hall that creates a welcoming entrance to this fine property and is the central hub of the ground floor layout. 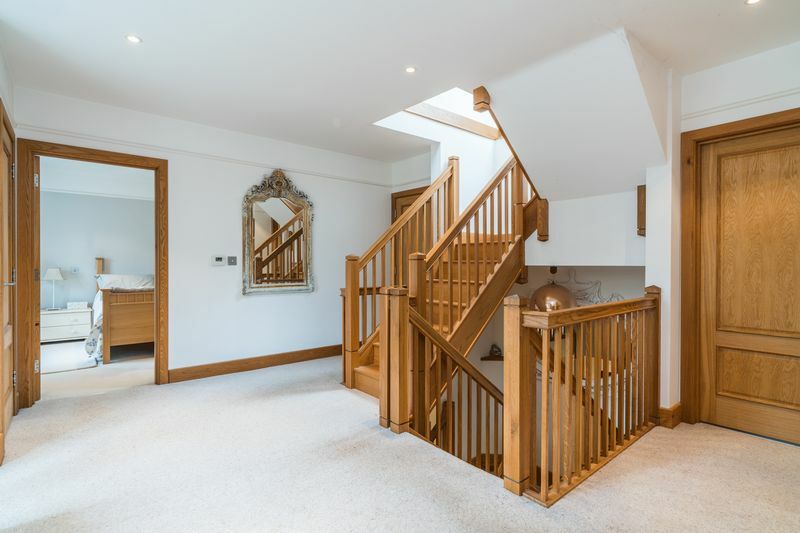 A quality handmade returning oak staircase ascends to the first floor and a walk-in cupboard and a further low level cupboard provide useful storage space. 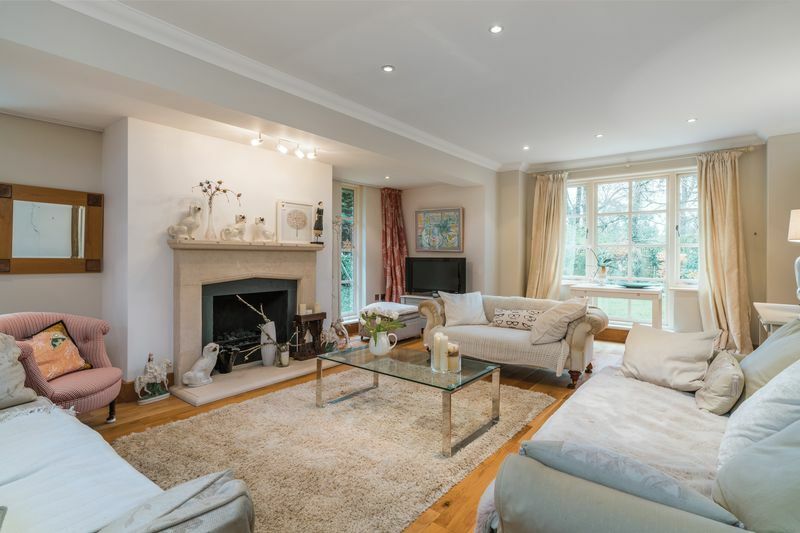 The lounge boasts engineered oak flooring and is a delightful triple aspect reception room enjoying a wonderful outlook in all directions with a feature limestone mantelpiece and a coal effect gas fire creating a pleasing focal point. A glazed door opens to the spacious dining room (currently used as a sitting room) with a window that together with a glazed door overlooks the rear garden. There is engineered oak flooring, a contemporary styled wall mounted log effect electric fire and display shelving. An oak door allows independent access to the hall and three quarter glazed triple folding doors conjoin with the large kitchen/breakfast room that is also approached from the hallway. The kitchen area comprises a range of wall and base units with complementary hardwood work surfaces that incorporate a single bowl sink unit and a mixer tap together with a matching dresser unit. 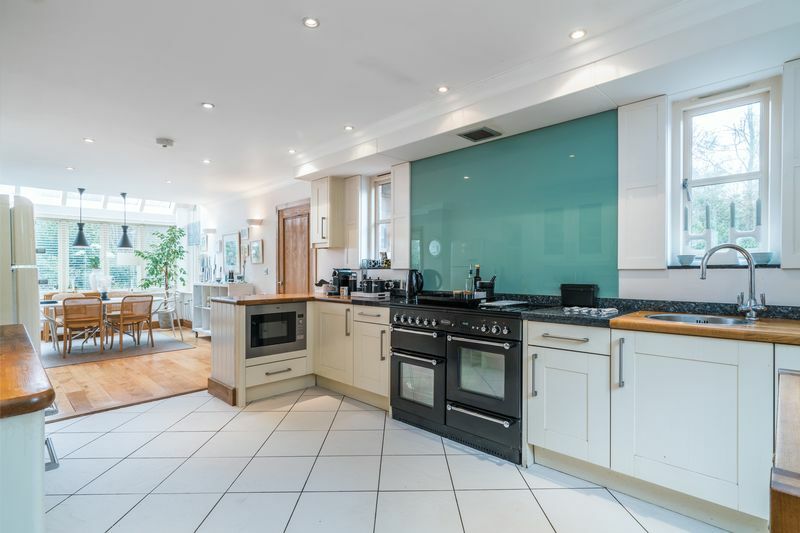 Fitted appliances include a range style cooker with an extractor hood and a coloured glass back and adjacent granite work surfaces, dishwasher and microwave oven. 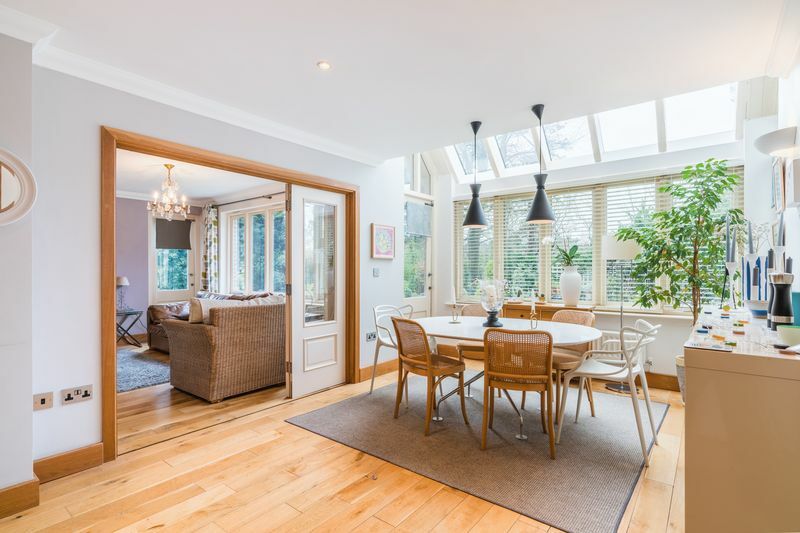 A notable feature is the part vaulted, high level glazed ceiling positioned above the breakfast area that combines with the part glazed door and rear aspect window to provide an enchanting area for informal dining that is bathed in natural light. Offering a separate entrance door the side lobby is served by a cloakroom and the corridor has store cupboards with a utility area and provides a contiguous link through to the impressive family room. This area has oak flooring and a high level vaulted ceiling featuring exposed beams with background lighting. A deep recessed fireplace houses a log burner with full width windows and doors enjoy attractive views of the garden and woodland beyond. The first floor landing continues the feeling of space emanating from the hall below and is more than generous in size. The oak staircase leads to the two loft bedrooms and two wardobes are installed either side of the front facing window together with the airing cupboard. Of enviable proportions the dual aspect master bedroom features fitted wardrobes and is served by an en-suite shower room that comprises a three piece white suite. Bedroom two enjoys delightful woodland views and is a more than generous room with a double wardrobe and is served by an en-suite shower room. Bedroom three is a double and also has the added advantage of a fitted wardobe. 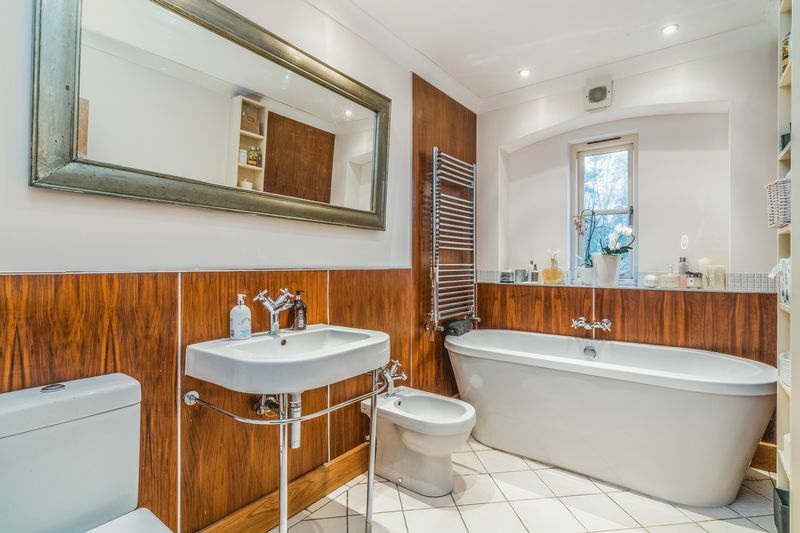 The stylish family bathroom displays a modern four piece white suite comprising a bath with side mounted taps, close coupled WC, bidet and a wash hand basin. Part wood panelled walls, a tiled floor and a chrome heated towel complete the specification. 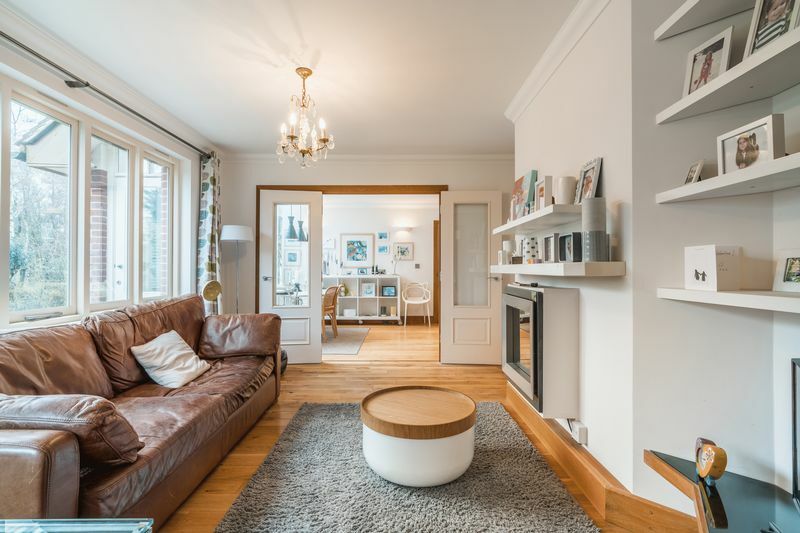 The second floor comprises two additional matching dual aspect double bedrooms boasting vaulted ceilings with high level gable windows and skylights providing an abundance of natural light. Both enjoy en-suite shower rooms therefore providing excellent guest accommodation. The driveway is finished in Mendip stone gravel and allows off road parking and turning for numerous vehicles with laurel hedging, mature shrubs and trees creating a good degree of natural privacy. Pedestrian gates either side of the house lead to the rear garden and outside lighting and a tap are installed. The detached garage is larger than the average single and is approached via an up and over door. The adjacent home office is the perfect work from home venue and has the added advantage of a cloakroom. A car port positioned to the left provides covered access to a side stable door opening to a staircase that leads up to the studio flat. High level ceilings incorporate glazed panels that let natural light flood in and create a bright and airy feel to the principal area that comprises a bed/sitting room with a small balcony. A compact kitchenette is installed with a concealed two ring electric hob, a sink unit and mixer tap. A door leads to the shower room with space and plumbing for a washing machine whilst a door leads to a cloakroom that has a close coupled WC. 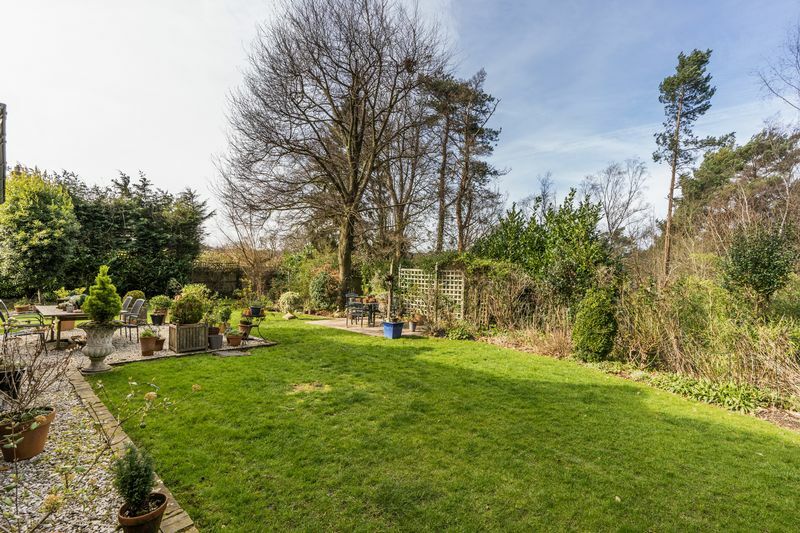 The rear garden enjoys a delightful outlook backing onto mature woodland that provides sylvan views and a pleasing vista. Predominantly laid to lawn, the garden has an ornamental gravel seating area approached from the breakfast room and is the perfect place for al fresco dining and relaxing during the summer months. A host of mature shrubs and trees ensures a pleasant setting with a further patio on the rear boundary nestling underneath a mature beech tree providing welcome shade whilst a pedestrian gate leads to the woods behind. 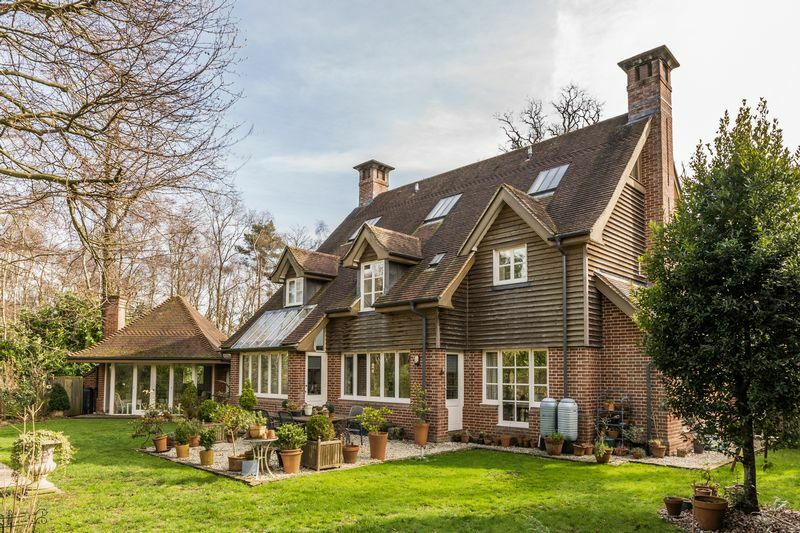 This modern family home benefits from underfloor heating to the ground floor with radiators on the first and second floor, bespoke handmade wooden double glazed windows and wiring for a security system. External joinery is European oak. Head away from Southampton along the Chilworth road (A27) and opposite the Chilworth Arms public house, turn right into Woodside. Follow the lane where the property will be found on the left after a short distance (post code for Sat Nav purposes is SO16 7LB).